An invasion is a military offensive consisting of all, or large parts of the armed forces of one geopolitical entity aggressively entering territory controlled by another such entity. The objective can be to conquer, liberate, or re-establish control or authority over a territory, altering the established government, or gaining concessions from said government, or a combination thereof. An invasion can be the cause of a war, be used as a part of a larger strategy to end a war, or it can constitute an entire war in itself. Invasions are large scale operations involving significant military forces and complex planning, as well as having significant impact on the territory and its people being invaded. Some of these consequences can be beneficial to those invaded, even if not immediately. On many occasions cultural development occurred as a result of the interactions among invaders and invaded. For example, the Roman invasion and occupation of Great Britain led the British to emulate Rome when establishing their own empire. Not all invasions are successful in accomplishing their objectives—Napoleon's invasion of Russia, for example, failed to capture Moscow. Some invasions have unintended and unforeseen consequences—the Persian invasion by Xerxes I led to the formation of the Greek nation from what had previously been separate city-states. The motivation of the invaders ranges from desire for control over an area for selfish reasons, to recapturing an area previously under their control, to the liberation of others from an oppressor. Thus, while violent conflict, which usually accompanies any invasion, can be judged as not an ideal way for entities to relate, invasions themselves are not necessarily the result of evil or self-centered motivation. And even when they are, the outcome may prove beneficial to the societies involved. The term invasion denotes a strategic endeavor of substantial magnitude in which military forces aggressively enter another's territory. Since the goals of an invasion are usually large-scale and long-term, a sizable force is needed to hold territory and to protect the interests of the invading entity. Smaller-scale, tactical cross-border actions, such as skirmishes, sorties, raids, infiltrations, or guerrilla warfare, are generally not considered invasions. Military operations that occur within the territory of a single geopolitical entity may be termed an invasion if armed forces enter into a well-defined panthe other faction in a civil war or insurrection situation. For example, during both the American Revolutionary War and the American Civil War many of the military operations conducted during these wars are called invasions for this reason even though they did not involve "foreign" armies entering from "foreign" nations. It should be noted that the term invasion does not imply that the course of action was either justified or unjustified. For example, German military operations conducted against Poland in 1939 which precipitated World War II are often called the Invasion of Poland, while military operations conducted against Nazi-controlled France in 1944 for the purpose of liberation are called the Invasion of Normandy. Both military operations are properly called invasions because they involved an outside force entering territory not under its authority or control. Archaeological evidence indicates that invasions have been frequent occurrences since prehistory. In antiquity, the only way to ensure adequate reinforcements was to move armies as one massive force. This, by its very nature, led to the strategy of invasion. With invasion came cultural exchanges in government, religion, philosophy, and technology that shaped the development of the ancient world. States with potentially hostile neighbors typically adopt defensive measures to delay or forestall an invasion. In addition to utilizing geographical barriers such as rivers, marshes, or rugged terrain, these measures have historically included fortifications. 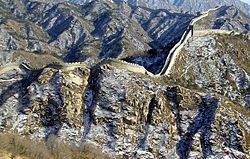 Such a defense can be intended to actively prevent invading forces from entering the country by means of an extended and well-defended barrier: The Great Wall of China, Hadrian's Wall, and the Danewerk are famous examples. Such barriers have also included trench lines and, in more modern times, minefields, cameras, and motion-sensitive sensors. However, these barriers can require a large military force to provide the defense, as well as maintain the equipment and positions, which can impose a great economic burden on the country. Some of those same techniques can also be turned against defenders, used to keep them from escape or resupply. For example, during Operation Starvation, Allied forces used airdropped mines to severely disrupt Japanese logistical operations within their own borders. Dover Castle Kent, south coast of England, overlooking the English Channel. The fortifications may be built up at a series of sites, such as castles or forts placed near a border. Such structures are designed to delay an invasion long enough for the defending nation to mobilize an army of size sufficient for defense or, in some cases, counter-invasion. Forts can be positioned so that the garrisons can interdict the supply lines of the invaders. The theory behind these spaced forts is that the invader cannot afford to bypass these defenses, and so must lay siege to the structures. The view from a battery at Ouvrage Schoenenbourg along the Maginot Line in Alsace. Notice the retractable turret in the left foreground. In modern times, the notion of constructing large-scale static defenses to combat land-based threats has become largely obsolete. The use of precision air campaigns and large-scale mechanization have made lighter, more mobile defenses necessary. The obsolescence of large fortifications was displayed by the failure of the Maginot Line in the beginning of World War II. Nations defending against modern invasions generally use large population centers such as cities or towns as defensive points. The invader must capture these points to destroy the defender's ability to wage war. The defender uses mobile armored and infantry divisions to protect these points, but the defenders are still very mobile and can retreat if necessary. However, static emplacements remain useful in both defense against naval attacks and defense against air attacks. Naval mines are an inexpensive but effective way to defend ports and choke off supply lines. Large, static, air-defense systems that combine antiaircraft guns with missile launchers are still the best way to defend against air attacks. In particularly large nations, the defending force may retreat, drawing the invaders deeper into hostile territory. One effect of this tactic is that the invading force becomes too spread out, making supply difficult and making the lines more susceptible to counter-attack. It can also cause the invading force to extend too far, allowing a pincer movement to cut them off from reinforcements. This was the cause of the British defeat at the Battle of Cowpens during the American Revolutionary War. Also, sending too many reinforcements can leave too few defenders in the attackers' territory, making it vulnerable to a counter-invasion, as happened in the Second Punic War. There are many different methods by which an invasion can take place, each method having strengths and weaknesses. They include invasion by land, sea, or air, or any combination of these methods. Invasion over land is the straightforward entry of armed forces into an area using existing land connections, usually crossing borders or otherwise defined zones, such as a demilitarized zone, overwhelming defensive emplacements and structures. Although this tactic often results in a quick victory, troop movements are relatively slow and subject to disruption by terrain and weather. Furthermore, it is hard to conceal plans for this method of invasion, as most geopolitical entities take defensive positions in areas that are most vulnerable to such invasions. In modern warfare, invasion by land often takes place after, or sometimes during, attacks on the target by other means. Airstrikes and cruise missiles launched from ships at sea are a common method of "softening" the target. Other, more subtle, preparations may involve secretly garnering popular support, assassinating potentially threatening political or military figures, and closing off supply lines where they cross into neighboring countries. In some cases, those other means of attack eliminate the need for ground assault: The 1945 atomic bombing of Hiroshima and Nagasaki ultimately made it unnecessary for the Allies to invade the Japanese home islands with infantry troops. In such cases, if ground troops are still needed to occupy the conquered territory, they are allowed to enter under the terms of a treaty and as such are no longer invaders; often the conventional fighting is effectively over before the infantry arrives in the role of peacekeepers. Invasion by sea is the use of a body of water to facilitate the entry of armed forces into an area, often a landmass adjoining the body of water or an island. This is generally used either in conjunction with another method of invasion, and especially before the invention of flight, for cases in which there is no other method to enter the territory in question. The advantages of this method include the ability to perform a surprise attack from sea, and that naval defenses may prove inadequate to repel such an attack. However, the large amount of specialized equipment, such as amphibious vehicles, and the difficulty of establishing defenses—usually with a resulting high casualty count—in exchange for a relatively small gain, are often serious drawbacks to this invasion method. Underwater hazards and a lack of good cover are very common problems during invasions from the sea. For example, at the Battle of Tarawa in the Pacific Theatre of World War II, Marine landing craft became stuck on a coral reef and were shelled from the beach. Most of the few survivors of the first wave were pinned down on the beach. Thousands of paratroopers descend during Operation Market Garden. Invasion by air is an invention of the twentieth century and modern warfare. This involves sending military units into a territory by aircraft. The aircraft either land, allowing the military units to debark and attempt their objective, or the troops exit the aircraft while still in the air, using parachutes or similar devices to land in the territory. 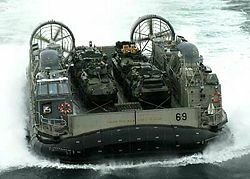 Air assaults may be used to prepare the way for a ground- or sea-based invasion, taking key positions deep behind enemy lines such as bridges and crossroads. An entirely air-based invasion has never succeeded. Two immediate problems are resupply and reinforcement. A large airborne force cannot be adequately supplied without meeting up with ground forces; an airborne force too small simply places themselves into an immediate envelopment situation. Advantages of this method relate to the ability to target specific areas that may not necessarily be easily accessible by land or sea, a greater chance of surprising the enemy and overwhelming defensive structures, and, in many cases, the need for a reduced number of forces due to the element of surprise. Disadvantages typically involve the capacity to perform such an invasion—such as the number of planes that would be needed to carry a sufficient number of troops—and the need for a high level of intelligence in order for the invasion to be successful. Examples of air invasion are the Battle of Crete, Operation Thursday, (the Chindits second operation during the Burma Campaign), and Operation Market Garden. The latter was an assault on the German-occupied Netherlands conducted in September 1944. 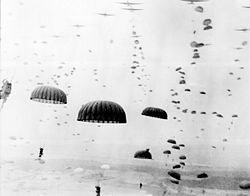 Nearly 35,000 men were dropped by parachute and glider into enemy territory in an attempt to capture bridges from the Germans and make way for the Allies' advance. However, even with such a massive force taking the Germans completely by surprise, the assault was a tactical failure and after nine days of fighting the Allies managed only to escape back to their own lines, having sustained over 18,000 casualties. Without a steady flow of supplies, an invading force will soon find itself retreating. Before his invasion of Greece, Xerxes I spent three years amassing supplies from all over Asia; Herodotus wrote that the Persian army was so large it "drank the rivers dry." In most invasions, even in modern times, many fresh supplies are gathered from the invaded territories themselves. Before the laws of war, invaders often relied heavily on the supplies they would win by conquering towns along the way. During the Second Punic War, for example, Hannibal diverted his army to conquer cities simply to gather supplies; his strategy in crossing the Alps necessitated traveling with as few provisions as possible, expecting the Roman stores to sustain them when they had breached the border. The scorched earth tactics used in Russia forced Napoleon to withdraw his forces due to lack of food and shelter. Today, the laws of war forbid looting and the confiscation of private property, but local supplies, particularly perishables, may be purchased for use by occupying forces, and airplanes may use parachutes to drop supplies to besieged forces. Even as the rules have become stricter, the necessities of war have become more numerous: In addition to food, shelter, and ammunition, armies require fuel, batteries, spare mechanical parts, electronic equipment, and so forth. A vital feature of invasion support is communication between the leadership and the invasing force. In ancient times, this often meant that a king led his armies in person to be certain his commands were followed, as in the case of Alexander the Great. At that time, the skills needed to lead troops in battle were as important as the skills needed to run a country during peacetime. When it was necessary for the king to be elsewhere, messengers would relay updates back to the rear, often on horseback or, in cases such as the Battle of Marathon, with swift runners. On other occasions, ships were used to relay information by sea. Thus, the HMS Pickle brought Britain the first news that Nelson had defeated the French forces at the Battle of Trafalgar. The development of Morse Code, and later voice communications by radio and satellite, have allowed even small units of skirmishers to remain in contact with the larger invasion force, to verify orders or call for artillery support and airstrikes. These communications were critical to the German blitzkrieg strategy, as infantry commanders relayed defensive positions to tanks and bombers. The outcomes of an invasion vary according to the objectives of both invaders and defenders, the success of the invasion and the defense, and the presence or absence of an agreed settlement between the warring parties. The most common outcome is the loss of territory, generally accompanied by a change in government. This sometimes results in the transformation of that country into a client state, often accompanied by requirements to pay reparations or tribute to the victor. In other cases, the results of a successful invasion may simply be a return to the status quo: This can be seen in wars of attrition, when the destruction of personnel and supplies is the main strategic objective, or where a nation previously subdued and currently occupied by an aggressive third party is restored to control of its own affairs (for example, Western Europe following the Normandy landings in 1944, or Kuwait following the defeat of Iraq in 1991). In some cases, the invasion may be strategically limited to a geographical area, which is carved into a separate state, as with the Bangladesh Liberation War in 1971. 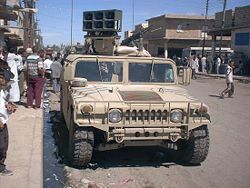 U.S. forces distribute information on the streets of Kut, Iraq. Once political boundaries and military lines have been breached, pacification of the region is the final, and arguably the most important, goal of the invading force. Many factors need to be taken into account when deciding which tactics to use after occupation. After the defeat of the regular military, or when one is lacking, continued opposition to an invasion often comes from civilian or paramilitary resistance movements. Complete pacification of an occupied country can be difficult, even impossible; popular support is vital to the successful conclusion of an invasion. Media propaganda such as leaflets, books, and radio broadcasts can be used to encourage resistance fighters to surrender and to dissuade others from joining their cause. Pacification, often referred to as "the winning of hearts and minds," reduces the desire for civilians to take up resistance. This may be accomplished through education, allowing conquered citizens to participate in their government, or, especially in impoverished or besieged areas, simply by providing food, water, and shelter. Sometimes displays of military might are used: Invading forces may assemble and parade through the streets of conquered towns, attempting to demonstrate the futility of any further fighting. Such displays may also include public executions of enemy soldiers, resistance fighters, and other conspirators. Particularly in antiquity, the death or imprisonment of a popular leader was sometimes enough to bring about a quick surrender. However, on occasion this had the unintended effect of creating martyrs around which popular resistance rallied. Such an example is Sir William Wallace, who, centuries after his execution by the English, remains a symbol of Scottish nationalism. Due to the fact that an invasion involves the movement of large numbers of people into an enemy land, with the outcome often being a continued occupation of that territory for a prolonged time period, invasions have significantly impacted the cultures of those involved. Thus, invasions in history have frequently gone beyond their military significance in determining who will rule an area. On many occasions the outcome dramatically changed the social and cultural landscape. The following are a few examples. Sargon II of Assyria, during the course of conquering much of what is now known as the Middle East, defeated the Kingdom of Israel in 722 B.C.E. and sent its inhabitants into exile. This presaged future Greek and Roman conquest and, later, the Crusades. To this day, the region remains contested. Battle of Thermopylae and movements to Salamis, 480 B.C.E. In 480 B.C.E., Xerxes I of Persia moved his armies against the loose confederation of city-states in what is modern-day Greece. One of the most famous battles of the war, fought at Thermopylae, is an early example of using a chokepoint to tactical advantage. Although Xerxes' army was vast—modern estimates put it at 250,000—the defending Greeks were able to hold their ground for days by using a narrow mountain pass to slow the Persian advance. The invasion also demonstrates the importance of communication and supply routes; although Xerxes' land battles were almost all Persian victories, the Greeks managed to cut off his naval support and the Persians were forced to withdraw. The invasion served to unify the various city-states, bringing about the formation of the Greek nation. In 323 B.C.E., Alexander the Great led his army into Persia, defeating Darius III, conquering Babylon, and taking control of the Persian Empire. Alexander's influence in mixing cultures led to the Hellenistic Age of Mesopotamia and North Africa. In the Roman conquest of Britain in the first century, Aulus Plautius led the Roman main invasion force, an army composed of four legions. It sailed in three divisions, and is generally believed to have landed at Richborough in Kent, although parts may have landed elsewhere. The Britons, led by Togodumnus and Caratacus of the Catuvellauni, were reluctant to fight a pitched battle, relying instead on guerrilla tactics. However, Plautius defeated first Caratacus, then Togodumnus, on the rivers Medway and Thames, and became governor of the conquered territory. The Roman occupation of Britain, which ended in 410, left a permanent mark on Britain and on the island's future role in the world. Centuries later, as it acquired its own empire, it set itself the task of emulating Ancient Rome. Following the Islamic prophet Muhammad's unification of the Arabian peninsula in 632, his successors, the Caliphs, began a series of invasions of the Middle East, North Africa, Southern Europe, and South Asia. Lasting slightly more than a century, these conquests brought much of the ancient world under Arab, and thus Muslim, rule. The 1066 C.E. invasion of England by William the Conqueror, and the decisive battle which won the war, the Battle of Hastings, were to have profound effects on the historical and societal development of Britain, and the English language. In a series of nine different major invasions from 1095 C.E. to 1291 C.E., the Catholic Church and various European states attempted to liberate the Holy Land for Christendom from its Muslim conquerors, with varied success until the fall of Acre in 1291. As Jerusalem changed hands and European forces moved back and forth, in-roads to the Levant were reestablished and the cultures mixed on a large scale for the first time in centuries. All significant conquests and movements of Genghis Khan and his generals during his lifetime. From 1206 C.E. until his death in 1227, Genghis Khan orchestrated a series of invasions that united much of Asia. Relying heavily on cavalry, the Mongol hordes were able to travel quickly yet were well-supplied. His eastward invasion of China created the Yuan Dynasty, and his westward invasion of Kievan Rus' further linked Europe and Asia by reestablishing the Silk Road. Before the Mongol invasion, Chinese dynasties reportedly had approximately 120 million inhabitants; after the conquest was completed in 1279, the 1300 census reported roughly 60 million people. The thirteenth century, when the Mongol Empire came to power, is often called the "Age of the Mongols." 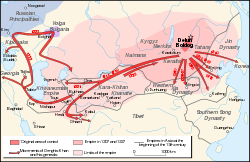 Mongol armies expanded westward under the command of Batu Khan in the Mongol invasion of Europe. Their western conquests included almost all of Russia (save Novgorod, which became a vassal), half of Hungary, and Poland. Mongolian records indicate that Batu Khan was planning a complete conquest of the remaining European powers, beginning with a winter attack on Austria, Italy, and Germany, when he was recalled to Mongolia upon the death of Great Khan Ögedei. 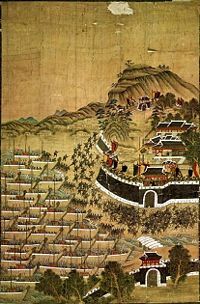 Japanese landing at Busan, 1592 (Painting of defense of Busanjin Fortress). During the late-fourteenth century, Islamic warlord of Turco-Mongol descent Timur the Lame conquered much of western and central Asia. In 1398, Timur invaded India on the pretext that the Muslim sultans of Delhi were too much tolerant to their Hindu subjects. During the Japanese invasions of Korea (Japan's Korea War: First Invasion (1592-1596) and Japan's Korea War: Second Invasion (1596-1598), the Japanese warlord Toyotomi Hideyoshi, with the ambition of conquering Ming China, invaded Korea with his daimyō and their troops in 1592 and again in 1597. Japanese prevailed on land, but following several defeats at the hands of Korean and Ming China forces coupled with Hideyoshi's death, Japanese troops were withdrawn in 1598. 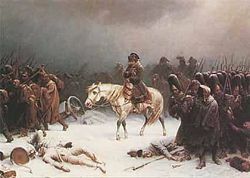 Napoleon's retreat from Moscow, painted by Adolph Northen. In 1812 C.E., Napoleon led his Grande Armée into Russia. At that point, his invasion force of 691,500 men was the largest ever assembled, and for several weeks the Russian Army could do nothing but retreat. The first major battle between the two armies, at the Russian defenses of Borodino, was one of the bloodiest single days in human history, with estimates of at least 65,000 dead. Although the Russian retreat allowed the French to capture Moscow, they were left depleted and without shelter or supplies. Napoleon was forced to withdraw. This did not bring final defeat to Napoleon, but it is credited with fostering a powerful patriotism in Russia that would lead to the strengthening of the nation in the nineteenth and twentieth centuries. The build-up of Omaha Beach: reinforcements of men and equipment moving inland during the invasion of Normandy. The vast numbers of the armies involved in World War II, combined with innovative tactics and technology, lent themselves to invasions on a scale that had not been seen before. After the Soviet invasion of Poland, following the German invasion that marked the start of World War II in 1939, the Soviet Union annexed eastern parts (so-called Kresy) of the Second Polish Republic. In 1940, the Soviet Union annexed Estonia, Latvia, Lithuania, Bessarabia, and Bukovina. The largest land invasion in history was Operation Barbarossa in 1941, in which 4,000,000 German troops blitzkrieged into the Soviet Union. Initially, the Germans advanced with great ease and nearly captured Moscow, also laying siege to Leningrad. However, they soon found themselves fighting the harsh Russian winter as well as stiff Soviet resistance, and their advance ground to a halt at Stalingrad in early 1943. It was the deadliest single theater of World War II. ↑ Nigel Bagnall, The Punic Wars: Rome, Carthage, and the Struggle for the Mediterranean (Thomas Dunne Books, 1990, ISBN 0312342144). ↑ Gerald A. Mason, Operation Starvation, Storming Media, 2002. Retrieved February 23, 2009. ↑ Douglas F. Ashton, "Tarawa: Testing Ground For The Amphibious Assault," GlobalSecurity.org, 1989. Retrieved February 23, 2009. ↑ George E. Koskimaki, Hell's Highway: Chronicle of the 101st Airborne Division in the Holland Campaign, September–November 1944 (101st Airborne Division Association, 1989, ISBN 187770203X). ↑ Herodotus, The Histories trans. Robin Waterfield (New York, NY: Oxford University Press, 2008, ISBN 978-0199535668). ↑ Polybius, The Histories, Book III, Loeb Classical Library, 1922, 248-249. Retrieved February 23, 2009. ↑ 7.0 7.1 7.2 Marc Van De Mieroop, A History of the Ancient Near East (Blackwell Publishing, 2003, ISBN 0631225528). ↑ John Riley-Smith, The Oxford History of the Crusades (New York, NY: Oxford University Press, 2001, ISBN 0192854283). ↑ Ping-ti Ho, "An Estimate of the Total Population of Sung-Chin China" Études Song 1(1) (1970): 33-53. ↑ Peter Baker, "Memories of Soviet Repression Still Vivid in Baltics," The Washington Post, May 7, 2005. Retrieved February 23, 2009. Bagnall, Nigel. The Punic Wars: Rome, Carthage, and the Struggle for the Mediterranean. Thomas Dunne Books, 1990. ISBN 0312342144. Buchanan, Patrick J., State of Emergency: The Third World Invasion and Conquest of America. York: Thomas Dunne Books, 2006. ISBN 978-0312360030. Coll, Steve. Ghost Wars: The Secret History of the CIA, Afghanistan, and Bin Laden, from the Soviet Invasion to September 10, 2001. New York, NY: Penguin Press, 2004. ISBN 978-1594200076. Eisenhower Foundation. 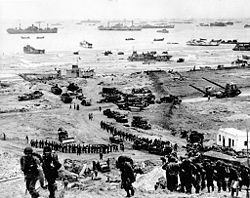 D-day: The Normandy Invasion in Retrospect. Lawrence, KS: University Press of Kansas, 1971. ISBN 978-0700600731. Gordon, Michael R., and Bernard E. Trainor. Cobra II: The Inside Story of the Invasion and Occupation of Iraq. New York, NY: Pantheon Books, 2006. ISBN 978-0375422621. Koskimaki, George E. Hell's Highway: Chronicle of the 101st Airborne Division in the Holland Campaign, September–November 1944. 101st Airborne Division Association, 1989. ISBN 187770203X. McEvedy, Colin, and Richard Jones. Atlas of World Population History. Puffin, 1978. ISBN 0140510761. Riley-Smith, John. The Oxford History of the Crusades. New York, NY: Oxford University Press, 2001. ISBN 0192854283. Skates, John Ray. The Invasion of Japan: Alternative to the Bomb. Columbia, SC: University of South Carolina Press, 1994. ISBN 978-0872499720. Van De Mieroop, Marc. A History of the Ancient Near East. Blackwell Publishing, 2003. ISBN 0631225528. Wyden, Peter. Bay of Pigs: The Untold Story. New York, NY: Simon and Schuster, 1979. ISBN 978-0671240066. This page was last modified on 23 February 2009, at 18:49.